« Mirri Make an Impact at Packaging Innovations! The time has come – our exciting new Mirri Wow Pack has been officially launched, having been adopted by one of the UK’s leading luxury British brands. We’ve had industry interest with lots of media interviews lined up – and you can read all about it in Packaging Europe and Converter Mag already. Why is this so exciting? Because it answers demand. Because it fixes a problem. Because it puts retailers back in control. The trend for unboxing luxury packages has been sweeping the internet, with YouTube now featuring almost 40 million videos, yet only 4% of luxury sales are eCommerce – this doesn’t make sense and is a huge missed opportunity. Research shows that consumers rank packaging almost equal to the brand when it comes to what’s important for overall satisfaction with a product ; that consumers are likely to repeat purchase from an online merchant that delivers premium packaging; and that half of customers expect online orders to arrive in premium packaging if that same retailer provides branded packaging in-store. So here is Mirri Wow Pack to answer these calls. Mark Askham, Mirri Development Manager at Celloglas said: “With the luxury eCommerce market predicted to grow to €70 billion by 2025 it’s long overdue for luxury retailers to ask themselves: why are only 4% of luxury sales eCommerce? Consumers are expecting more than the standard brown cardboard box from omni-channel retail now – it really is time to up the ante”. Using our new board-to-board laminator we can create bespoke boxes to customer requirements, and can supply the outer board, or work with a customer’s. Additional bespoke insert pockets can also be provided to protect products such as clothing, using bespoke paper, colours and finishes. As well as being a way to add value to a product, the Mirri Wow Pack also provides added protection due to the qualities of the metpol, and should it need to be returned, the packaging helps to ensure items remain in a condition suitable for re-sale, reducing loss from returns that have been damaged during transition. 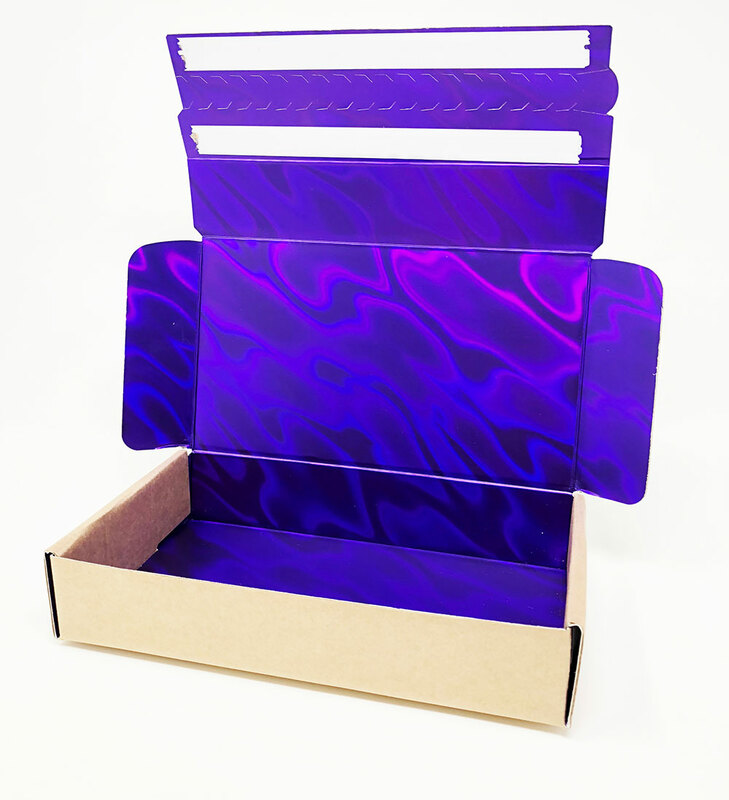 The box also features a tear-off section which reveals an adhesive strip, allowing the customer to easily re-package their returns. “Often overlooked by brand managers, packaging can play a major role in “non-conscious priming,” the sensory and environmental factors that give consumers emotional cues on the context and “premiumness” of their experience. The key concepts in the integrated sensory approach of sensory branding, sensory congruence and sensory experience need to be addressed within e-commerce packaging”. “The challenge is increasing packaging’s importance as an opportunity for brands to continue the brand story with consumers – the delivery of their online package should be a further extension of their positive brand experience, not simply a logistical mechanism for obtaining their desired product”. The Mirri Wow Pack is now available to be commissioned. We look forward to helping you wow this year! The Mirri Wow Pack can be made in a variety of styles and sizes to tailor to your needs. The pack can also be made to the majority of the FEFCO box designs.